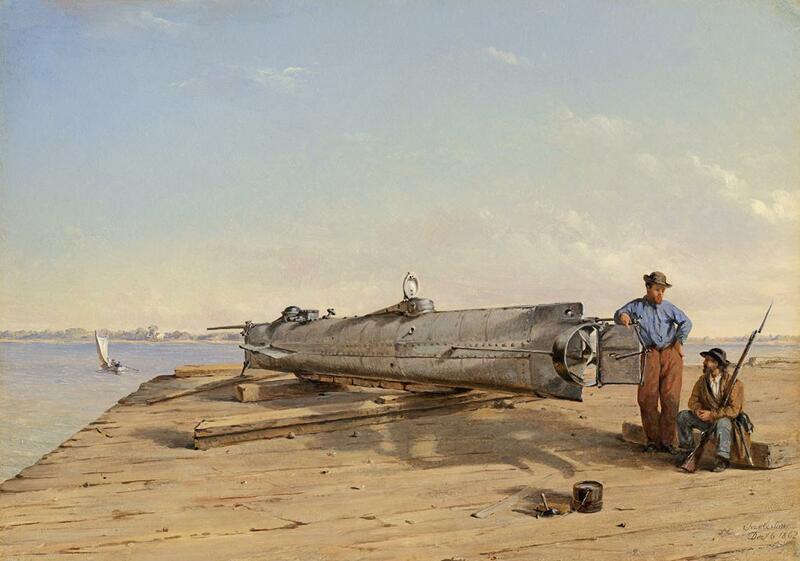 The HL Hunley was a 19th century submarine of the Confederate States of America, and the first submarine to sink a battleship. Despite her small size, the 12m (40ft) mini-submarine was one of the first subs to be used in conflict. She sank on 17 February 1864, during the American Civil War, after torpedoing the 1,240-displacement ton USS sloop-of-war Housatonic outside Charleston Harbor in South Carolina. Her sinking has remained a mystery, until now. In 1995, the Hunley was discovered lying approximately 300m (984ft) from the Housatonic's resting place. The assumption was that the blast of the torpedo hitting the battleship had also ruptured the hull of the submarine. This was found not to be in the case when the Hunley was raised in 2000. The eight-man crew were found to be in situ, sitting at their posts around the central crankshaft that made the submarine move. There was no evidence that the crew had attempted to escape the damaged sub. The team from Duke University have spent three years researching the submarine sinking and now believe they have an answer. Experiments on a mini-test sub have shown that the crew accidentally killed themselves. This is a characteristic trauma of blast victims. You have an instant fatality that leaves no marks on the skeletal remains. Hunley's torpedo was not self-propelled. Instead, a copper keg containing 135lbs of gunpowder was secured to the front of the Hunley's bow on a 5m (16ft) pole called a spar. The submarine was expected to ram this spar into the hull of the enemy ship. The torpedo would then explode. Unfortunately, this meant that the crew were, at best, a mere 12m (42ft) from the blast. The Duke University tests have revealed that the torpedo blast created a shockwave that was great enough to instantly rupture blood vessels in the lungs and brains of the submariners. They would have instantly died of "blast lung".